Cartrophen Vet (100mg/mL of pentosan polysulfate sodium or PPS) is a treatment for osteoarthritis (OA, also known as degenerative joint disease or DJD) and related musculoskeletal disorders in dogs and horses. It provides pain relief by acting on the pathology within the joint that causes pain and lameness. 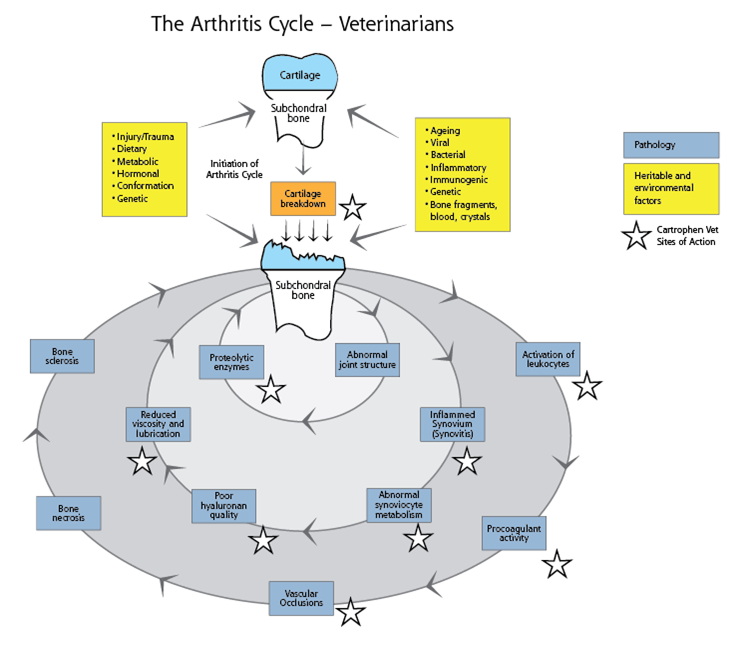 Cartrophen Vet has many sites of action within the underlying processes of the arthritis disease which helps maintain joint health including preserving joint cartilage. It is therefore classified as a disease modifying osteoarthritis drug (DMOAD). Cartrophen Vet is a prescription only, injectable, polysulfated polysaccharide of plant origin. With 20% of dogs over one year of age suffering from OA and 60% of lameness in the horse related to OA, Cartrophen Vet and DMOAD represent the rational approach to the medical treatment of OA. Cartrophen Vet is a treatment, which has activity that works to correct the underlying metabolism of the OA. By re-balancing the metabolic processes it preserves joint health and subsequently provides relief from the clinical signs of OA. Cartrophen Vet’s changes to the disease are evident in its long-term effects. Benefits are received well beyond the treatment period of 4 weeks with repeat treatments in some cases at one-year intervals. Cartrophen Vet has shown to be effective in 80% of dogs treated, further discussed in ‘Safety&Efficacy‘. Increased blood supply and nutrition to the joint and subchondral bone – Mobilizes thrombi and fibrin deposits, lipids and cholesterol in synovial tissues and subchondral blood vessels in order to allow increased blood flow to key areas of the synovial joint.